So the question is not whether we need to act. The overwhelming judgment of science — of chemistry and physics and millions of measurements — has put all that to rest. . . the question now is whether we will have the courage to act before it’s too late. “As a President, as a father, and as an American, I’m here to say we need to act. I refuse to condemn your generation and future generations to a planet that’s beyond fixing. “What you’ll hear from the special interests and their allies in Congress is that this will kill jobs and crush the economy, and basically end American free enterprise as we know it. . .that’s what they said every time America sets clear rules and better standards for our air and our water and our children’s health. And every time, they’ve been wrong. “Convince those in power to reduce our carbon pollution. Push your own communities to adopt smarter practices. Invest. Divest. Remind folks there’s no contradiction between a sound environment and strong economic growth. 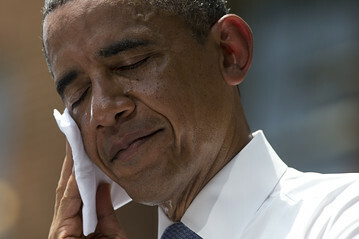 President Barack Obama wipes sweat from his face during a speech on climate change at Georgetown University on Tuesday. Thanks for posting. I had not seen the President’s speech before — just read and heard things about it.